​​How do some people recover, whilst others remain stuck? BUT, there is something that helps significantly in determining positive outcomes. It is something that can be easily lost, through the ups and downs of struggling with eating. It helped me put my eating issues behind me for good. When working with a client recently, they had lost all hope. They felt despondent and discouraged. They had given up. They felt resigned to the eating disorder. They had given up the fight. Consequently, the eating problem raged on. Symptoms were worse, as was sleep, mood and isolation. I felt for them, sitting in the hole of despair. When you’re in the hole, it can feel as if there is no way out. I have felt hopeless sometimes. I’m sure you have too. But, if you can find your hope again, it could change your whole future. In my own recovery, I held tightly to hope. I always believed that recovery was possible. I didn’t know how or when I was going to come through it, but I didn’t accept this as my lot. I wanted more than a life that may have become safe, but was also destroying me. You will believe there is a way out of this. This produces a powerful and proactive mindset. Instead, of feeling trapped, you will look for answers to solve problems and seek out solutions. In my own journey, I used therapy. I talked to trusted friends who understood. I read articles and self-help books. I ready recovery stories. I watched videos. No ‘one thing’ was the solution, but together, these provided a drip-drip of new and different perspectives. All were a little investment and contributing building block to change. 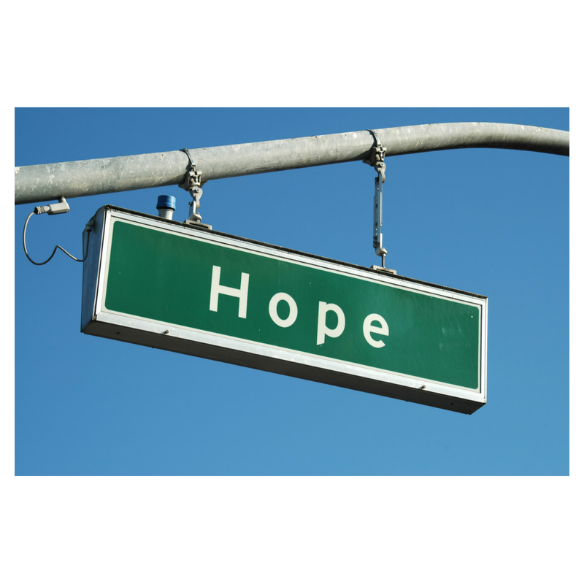 Hope helps you create a vision of a brighter and better life, even if you have no idea of how you might achieve this. It doesn’t matter if you don’t know the specifics, but daring to dream helps you understand what is important to you and lifts you up in your energy and ideas. Hope helps you set mini goals and think about the future. The risk of change becomes worth it. You seek out other hopeful travellers and encourage each other along. You distance yourself from the downers and energy sappers. You seek to hold on to the hope you have ignited. If you are not feeling hopeful right now, don’t ever give up. Think about how you can begin to feel a teeny-weeny bit more hopeful. Where can you begin? Feel empowered that you have some control over your feelings of hopefulness. However, despondent you feel, somewhere within you is a little pilot light of hope, waiting to be revitalized again. Stay hopeful. It will get through recovery.